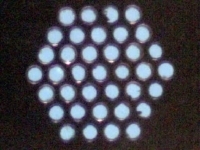 A 37 hole conductance laminated conductance array is designed to increase ion transmission from atmospheric pressure ionization sources into vacuum. This is our first on-line item with 37 x 50 um diameter openings into vacuum. The approximate entrance cross-section is abount 600 um but the gas throughput into vacuum is reduced by a factor of approximately 4. This tube and pinhole aperture replacement will increase ion transmission (sensitivity) while reducing gas load on electrospray, APCI, and AP-MALDI sources.